The Brahma Sutras along with the Upanishads and the Bhagavad Gita form the triple canon--the Prasthana-traya--of the spiritual tradition of India. A study of Shankaracharya`s great commentaries on them is indispensable for all students of Vedanta; and translation of the commentaries is of utmost importance to those whose limited knowledge of Sanskrit will not allow the study of the commentaries in the original. 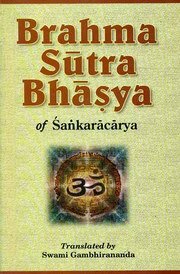 This volume presents a reliable translation of Shankara`s Commentary on the Brahma Sutras by the eleventh President of the Ramakrishna Order. Bibliographic Information: xxii. + 920p.